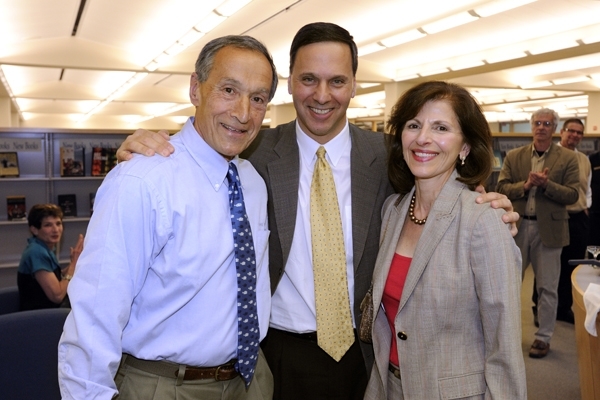 Jim Davis '66 and his wife Anne with President Ron Liebowitz. MIDDLEBURY, Vt. — At a ceremony on May 6, Middlebury College President Ron Liebowitz announced to members of the college community gathered in the library atrium that the library, which had remained unnamed since its completion in 2004, would now be called the Davis Family Library, in honor of Jim Davis, a member of the Middlebury class of 1966; his wife, Anne; their son, Chris, a member of the Middlebury class of 2008; and their daughter Kassia. Faculty, staff and students had learned recently that the library would be named for a longtime supporter of the college but the building’s new name had been kept secret until the ceremony. Many trustees who were on campus for a weekend of board meetings also attended. According to Liebowitz, the college had not wanted to be secretive but had held off from announcing the name only because the Davis family had shied away from public recognition of their often anonymous support. following the naming of the library. Photo by Brett Simison. 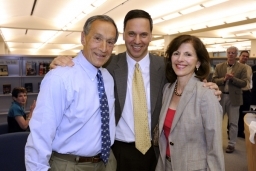 Liebowitz told the group that Middlebury had played a central role in Davis’ life, and that Davis often cited the important lessons he had learned at Middlebury from his professors, his friends, his football teammates and especially from his mentor and coach, Walter “Duke” Nelson. Davis, chairman of Mass.-based New Balance Athletic Shoe Company, bought the business six years after he graduated from Middlebury when there were only six employees. Now the third largest athletic shoe manufacturer in the nation, New Balance remains privately held. Citing examples of Davis’ impact on the college, Liebowitz said the family’s gifts had amounted to more than $70 million. Along with financial aid, faculty support and athletics, the library has always been of particular interest to the family. Liebowitz said it was Davis who pushed the college to forge ahead in 2000 with plans for the library despite administrators’ fiscal concerns, saying Middlebury couldn’t be a leading liberal arts college without a first-rate library and offering to provide financial support if needed. Davis was also the anonymous donor who underwrote the recent alumni participation challenge, helping to raise Middlebury’s alumni participation in giving to 62 percent, the highest in the nation. naming of the library. Photo by Brett Simison. Raising glasses of champagne and sparkling apple cider in a toast to Davis and his wife Anne, the crowd clapped and cheered when Liebowitz thanked the couple for their generosity and commitment. He then introduced Davis, who said, “As a family we do not seek and are not accustomed to receiving public acknowledgment for our community endeavors. We consider it our civic duty.” Davis explained that the family, which supports other organizations and cultural institutions, made an exception in this case. “We thought our example might inspire others to rethink their charitable commitments,” he said. Describing how his father had emigrated alone from Greece as a 15-year-old boy, Davis expressed his gratitude for his parents’ hard work and the aid he received from Middlebury, both of which made it possible for him to attend college, an opportunity his parents did not have. Davis noted the strength of free enterprise while acknowledging the challenging economic landscape for both business and higher education. He praised Middlebury for the progress it had made in managing its finances in the recession but said that had to be only the beginning if the college is truly to be a leader. “We must be more introspective, analyze our strengths and weaknesses, adjust and continuously improve the product,” said Davis. “Make it more affordable and increase the value of the experience.” Before concluding his remarks, he urged the president, administrators, faculty and staff to continue working together to make Middlebury the only true global liberal arts college. Xander Manshel '09 produced a short video in which three students express their appreciation for the library from different points of view. Photos by Brett Simison. The naming ceremony in the library was preceded by a discussion in McCullough. Glenn Andres, professor of art and director of the arts; Anne Knowles, associate professor of geography; Paul Monod, professor of history; Alexander Manshel, digital-media graduate intern and 2009 Middlebury graduate; and Mike Roy, dean of Library and Information Services discussed what architectural planners sought to achieve in designing the new library, the library’s importance in our era of digital communications, how students use the library, and its role in teaching and learning. Making do without the electronic portion of their presentations due to a power outage that began five minutes before the event, the speakers relied on the old fashioned spoken word to communicate their ideas. Roy noted the irony of the lack of electronic capabilities given the importance of digital resources in the library today. With the power returning just before he spoke, Manshel presented a brief video that he filmed and produced about the diverse ways that students use the library. For a photo gallery and more information about the Davis Family Library, visit go.middlebury.edu/librarynaming.